Punta Venezia is a peak along the North Monviso ridge. Its name dates back to the dawn of the 19th century, like others on this Alpine range dividing Italy from France – Punta Udine, Punta Trieste, Punta Roma – all names endued with precise national and geopolitical significance. Hannes Egger opens a path towards the sea, linking Alps to Adriatic and bringing out points of reciprocity among those mountaineering peaks where the idea of a frontier – it turns out, once again – depends simply on how you look at it. 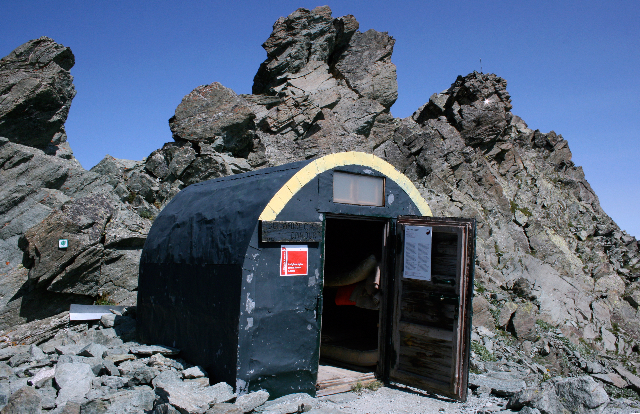 Thus the Customs Point in Venice becomes a rock-climbing challenge, while over in Piedmont the army fort on top of Punta Venezia has become an Alpine refuge for CAI Cavour (3,080 metres a.s.l. ), now dubbed the Padiglione Alpino. Shades of a ‘splinter‘ pavilion from Venice’s Architecture Biennale, now turned transnational and free for all: climbers, artists, the broader public and all who wish to show that they were here.